Forget engraving words into your wedding ring. Artist Sakurako Shimizu has designed wedding rings that include the image of a WAV file so you can capture an audio clip on your wedding ring. 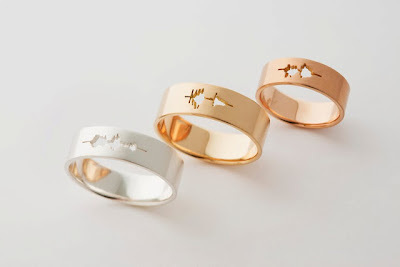 I love the idea of exchanging WAV files: your spouse's vows on your ring, yours on theirs. You won't be able to play the file back by putting your ring under a phonograph or anything, but you will be able to know that your beloved's voice imprint is right there with you, wherever you go. I don't think there's a more personal touch available. The final product has a really great effect. Given that everyone's voiceprint is pretty different, even if we all request "I do" rings, no two rings will likely be identical. There might be an added bonus too: if the ring leaves an imprint on your finger when you take it off (which of course, you never do, right? ), it could serve as a physical reminder (to you, or —ahem— anyone else) of your eternal union. Multi-use! So, the big question is: what would you put on your ring?